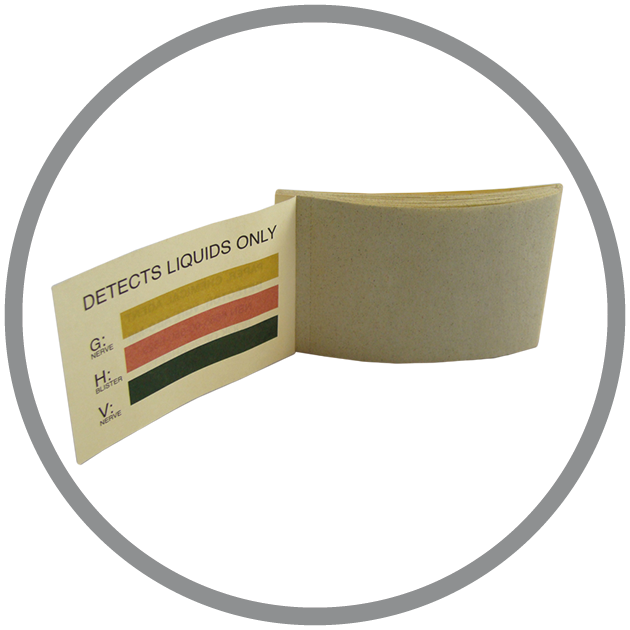 The M8 Chemical Detection Paper is used to detect the presence of liquid nerve (V and G types) and blister (H-) chemical agents. The M8 booklet is made up of 25 pages. The pages are perforated for easy removal. The book is heat-sealed in a polyethylene envelope. Each page has three sensitive indicator dyes. When a page is brought into contact with liquid that contains nerve or blister agents, the indicator dyes in the paper react with the agents to produce colored dots. The color indicates the type of agent present. M8 Paper can be purchased as a single book, a box of 50 books, or by the case. A case includes 20 boxes of 50 books, or 1000 books total. M8 is used by tearing out a sheet and attaching it to clothing, or some other surface so it can be exposed to drops of chemical liquid splash. The paper may also be placed in contact with a liquid that is suspected of contamination. If colored spots appear, a chemical agent is present. M8 Paper cannot be used to detect chemical agents in water or aerosol agents in the air. It does not detect vapors. It is best suited for non-porous materials. In 2012, the State of California’s FIRESCOPE Standardized Equipment List , listed the M8 as a required item for emergency and Hazmat first responders.